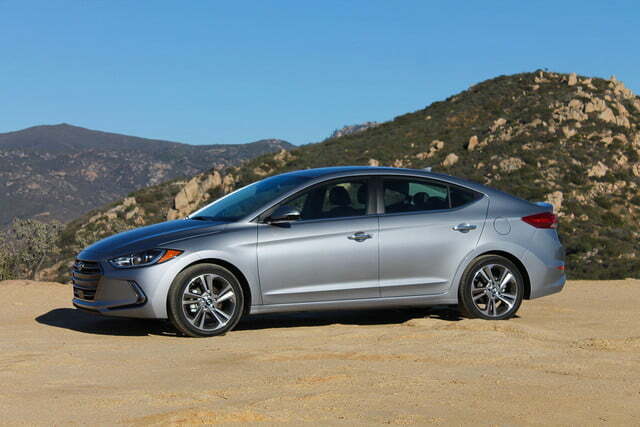 The focus of a compact car is wildly different than those of a luxury sedan, performance vehicle, or high-riding SUV. While those cars are tailored toward particular aspects of driving, a compact’s mission is much simpler — get people from point A to point B efficiently, safely, and economically. Accomplishing these goals is harder than it seems. 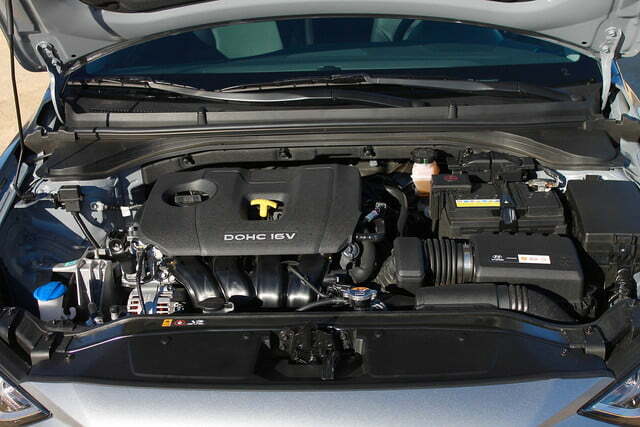 Previous entries in the compact market prioritized value and fuel economy above all else, equipping gutless engines, plastic interiors, and noisy rides to keep sticker prices low. But is a little extra cash worth driving a car that you hate? 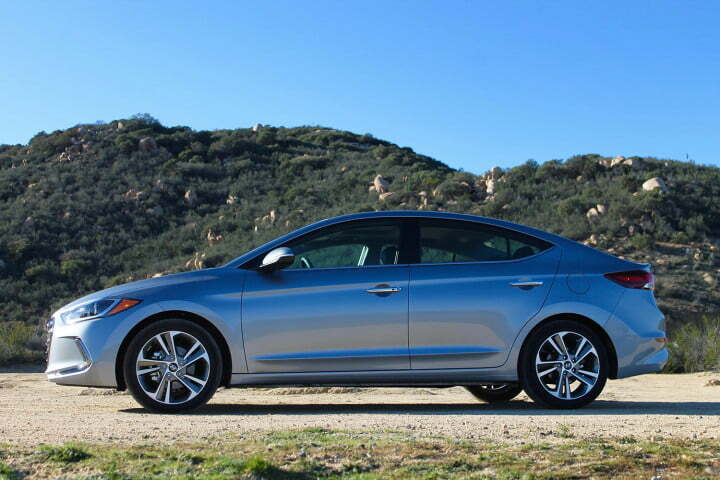 At the media launch for the 2017 Hyundai Elantra in San Diego, the brand spoke at length about the democratization of technology, which allows class above features and advanced manufacturing techniques to trickle down to more accessible segments. 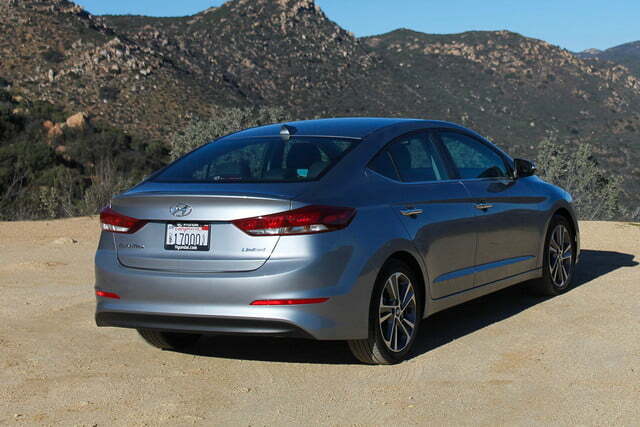 To make the Elantra better, then, Hyundai started from the ground up. 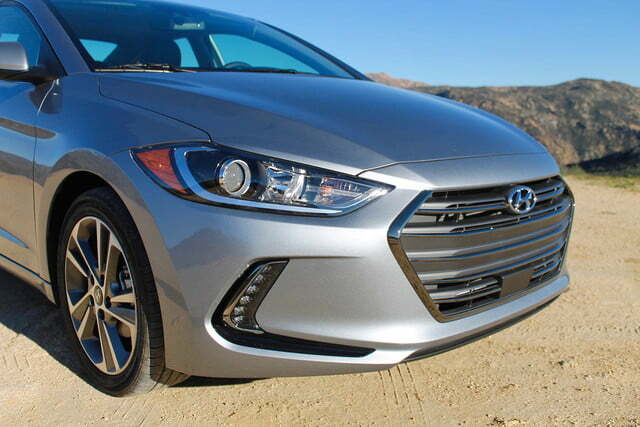 My first impression of the 2017 Elantra was one of conflict. The car made its official debut at the 2015 LA Auto Show, and although it is more classically attractive than the 2016 version, the sixth-generation model feels a bit vanilla. Like suited-up Wall Street businessman, the Elantra is well-appointed and sharp, but its conventional aesthetic blends into the crowd. The fifth-gen model was bold and expressive in contrast, looking as if it had just crawled out of the ocean and sprouted wheels. The new body is more aerodynamic though, as its front wheel air curtains and optimized underbody give it a drag coefficient of .27, better than a Porsche 911 Turbo. 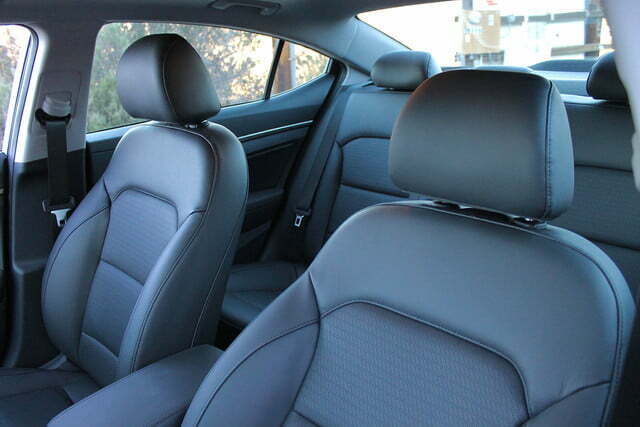 The interior follows a similar theme, because despite the fact that the materials are improved over last year (the available leather seats are particularly well-bolstered), the simpler, cleaner design is also significantly more generic. Personally, I happen to like the new layout, but you’ll be easily forgiven if you find it a bit humdrum. 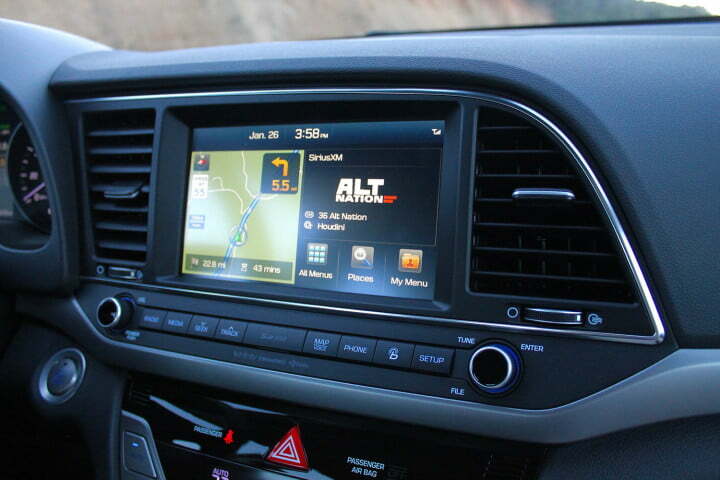 While the looks of the Elantra may be a bit safe, its list of available tech features more than makes up for it. The base touchscreen has been upgraded from 4.3 inches to 7.0 inches, and navigation-equipped models get a larger 8.0-inch unit. 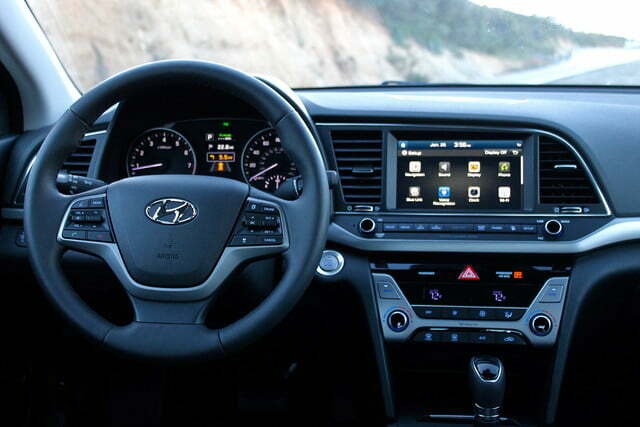 No matter which display you opt for, Hyundai is offering Android Auto and Apple CarPlay connectivity on the Elantra for the first time, as well as an eight-speaker Infinity stereo with Clari-Fi music restoration technology. Designed to enhance the quality of digital music, Clari-Fi uses a predictive algorithm to analyze music files and “rebuild” elements that are lost during the compression process, which certainly comes in handy in the age of high-convenience, low-quality audio streaming. It may not give you studio-grade audio — the bass is a bit lacking at times — but it definitely polishes things up nicely. 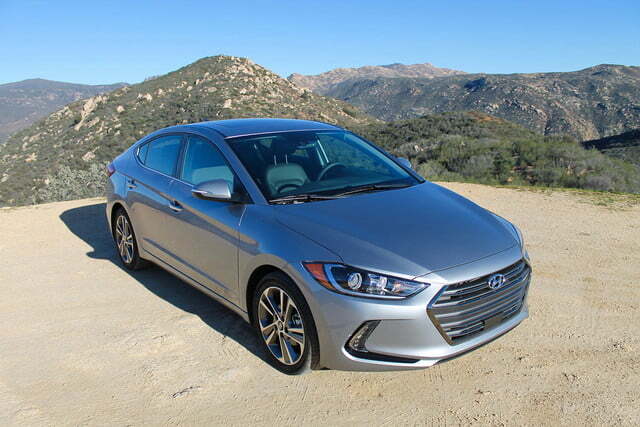 The Elantra starts at just $17,150 for 2017, but my range-topping Limited model ($22,350) was spec’d out with the $2,500 Tech Package and the $1,900 Ultimate Package, bringing the final damage up to $26,750 before tacking on $835 for destination. 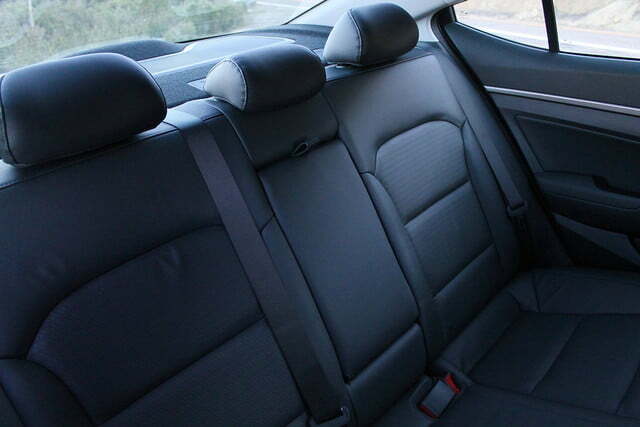 For the money, you get everything listed above, as well as two USB ports, a power sunroof, heated leather seats front and back, a hands-free trunk, Smart Cruise Control, Lane Keep Assist, Automatic Emergency Braking with Pedestrian Assist, and Hyundai’s Blue Link Connected Car System. 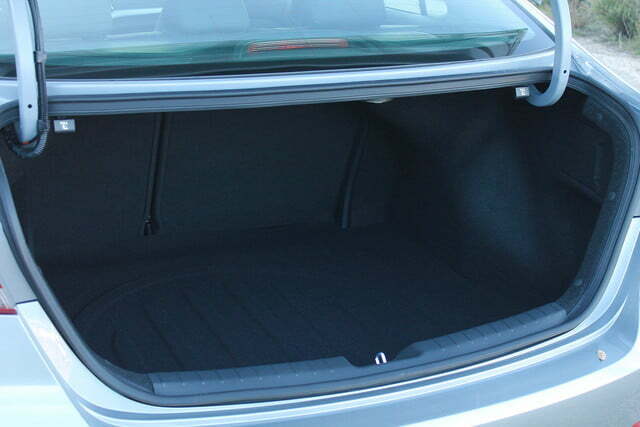 The Elantra also offers a generous 110.2 cubic feet of cargo volume, beating the 2016 Ford Focus and Mazda3, but falling slightly short to the Honda Civic and Toyota Corolla. 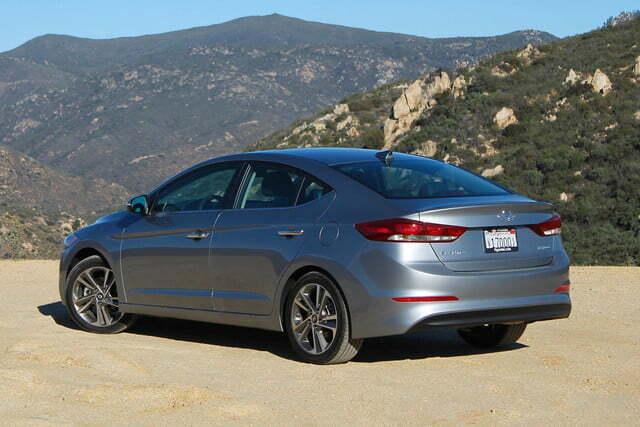 So what’s the Elantra like to drive? Without sounding like too much of a cynic, my colleagues in San Diego and I decided that the word of the day was “fine.” Not amazing, most certainly not terrible, but somewhere in the middle. Fine indeed. 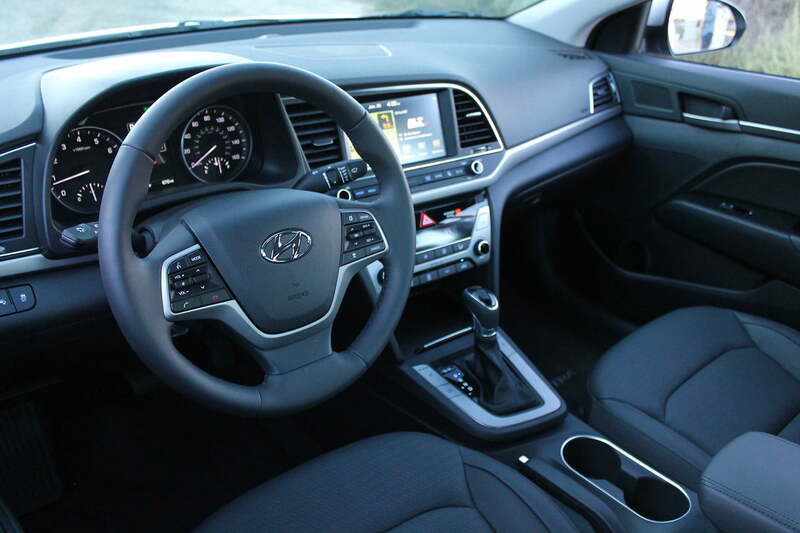 The 2017 Elantra offers Android Auto and Apple CarPlay for the first time, as well as an eight-speaker Infinity stereo. That’s not to say that Hyundai hasn’t improved the dynamics of this car, because the brand’s engineers most certainly have. 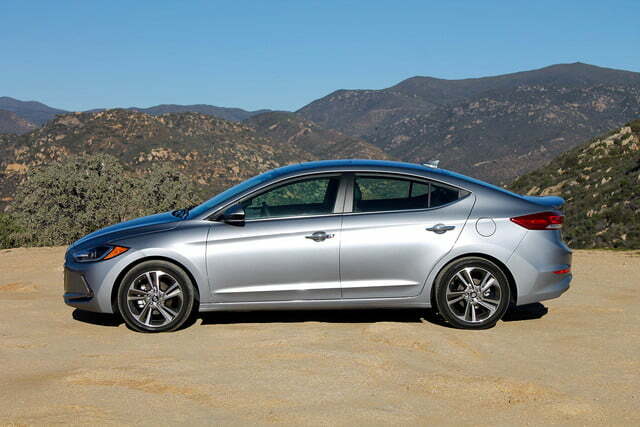 The Elantra rides on a revised chassis that features 53 percent high-strength steel and loads of structural adhesive, which makes the vehicle stiffer, more responsive, safer, and much, much quieter than before. The sedan is slightly lighter than its predecessor as well, and its rear suspension geometry has been tweaked to provide increased steering response and overall stability. 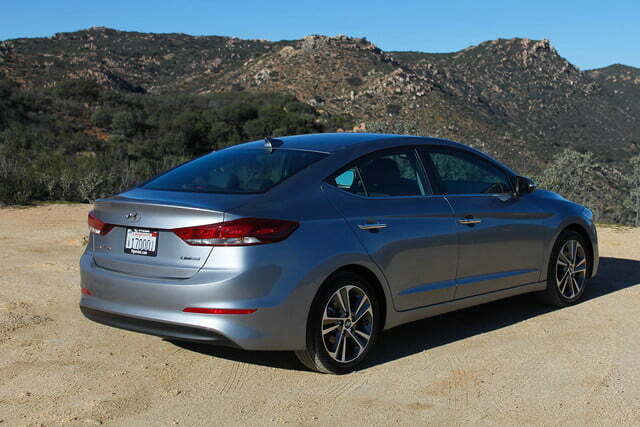 As I flung the Elantra through the curvy rock-lined roads near the Mexican border, the car felt linear and confident from my leather-trimmed seat, but I’d be lying if I said I was on the edge of it. 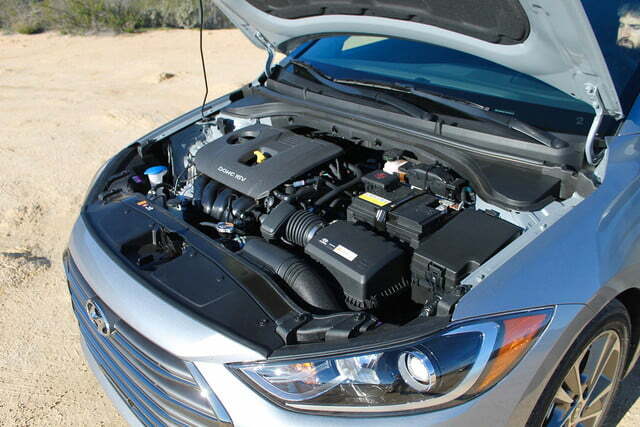 As far as powertrains go, there are two choices for the 2017 model year — a 2.0-liter four-cylinder with 147 horsepower and 132 pound-feet of torque, and a turbocharged 1.4-liter with 128 hp and 156 lb-ft. The 2.0-liter, which occupies the majority of the lineup, moved my Limited model’s 2,900-pound heft competently enough, but the six-speed automatic struggled to react with urgency up hills or out of tight bends. A manual is offered on entry-level trims only. 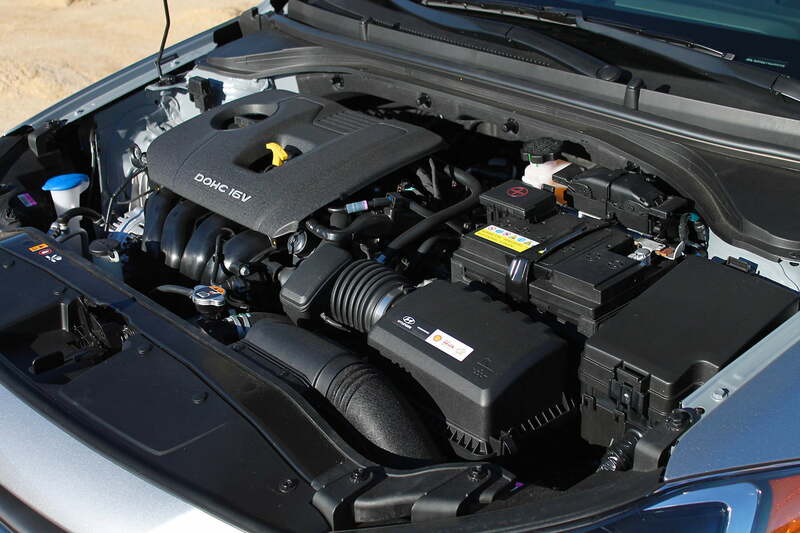 The Eco model’s turbocharged option is significantly more spry at the low end of the power band, but its primary focus is fuel efficiency. 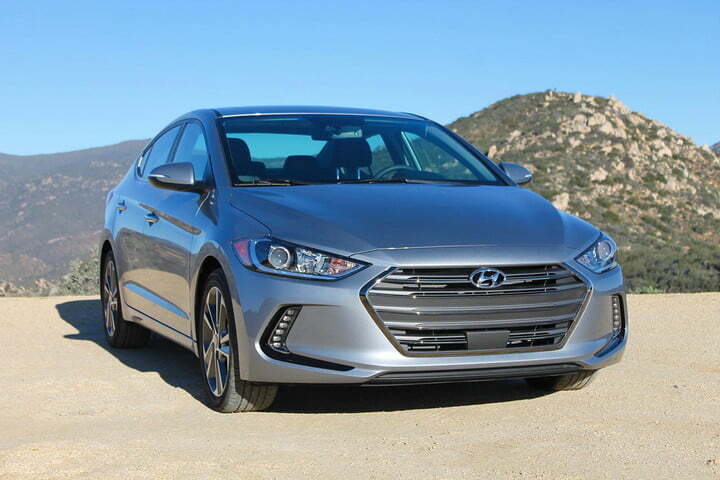 Hyundai estimates that the 1.4-liter will return around 35 mpg combined, and the 2.0-liter is officially rated at 29 mpg city, 38 mpg highway, and 33 mpg combined. 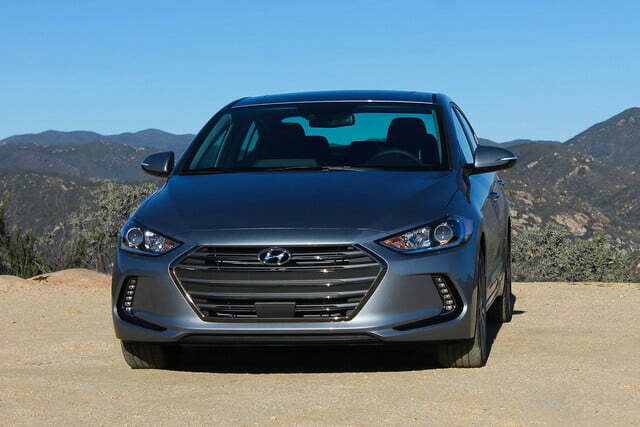 Overall, the 2017 Elantra is enjoyable and comfortable to drive, but not particularly thrilling. And while this segment doesn’t typically offer show-stopping experiences behind the wheel, the Civic, Ford Focus, and Mazda3 are probably better suited if you’re looking for a lively form of transportation. 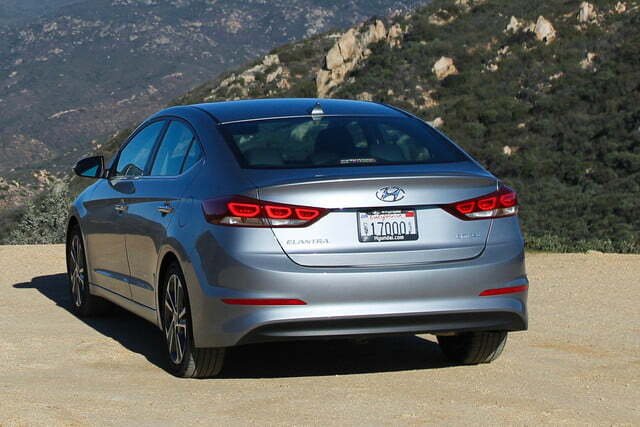 Where the Elantra impresses most is in its suite of available tech. 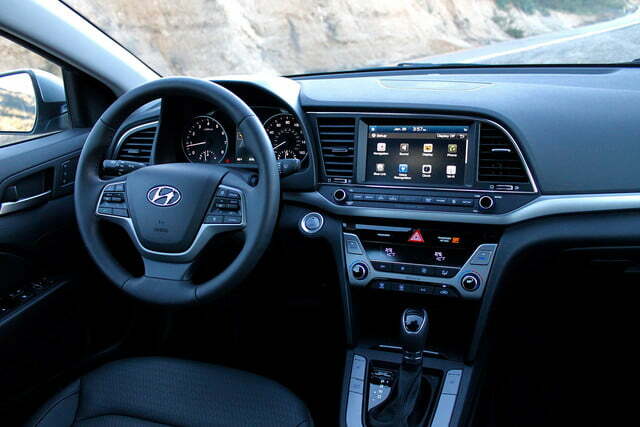 If anything, the vehicle’s safety and convenience features are what will drive potential buyers toward Hyundai dealerships, as the car equips several nameplate and segment-first gadgets and gizmos. 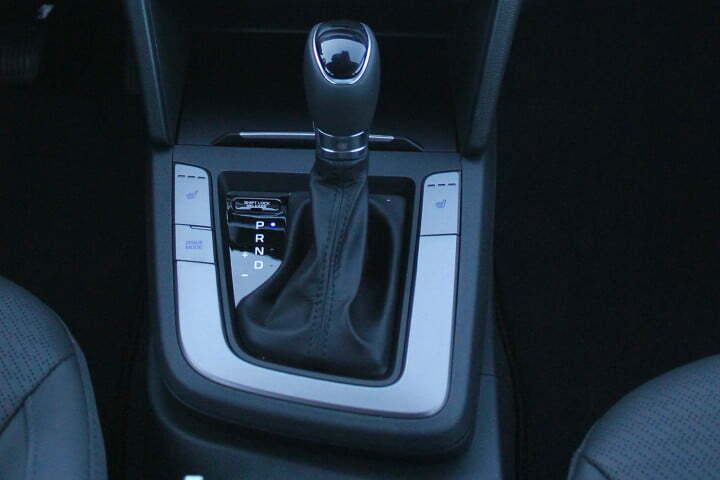 The most notable of the lot is Automatic Emergency Braking with Pedestrian Detection, which you won’t find on the Civic, Corolla, Focus, Mazda3, Chevy Cruze, or Nissan Sentra. 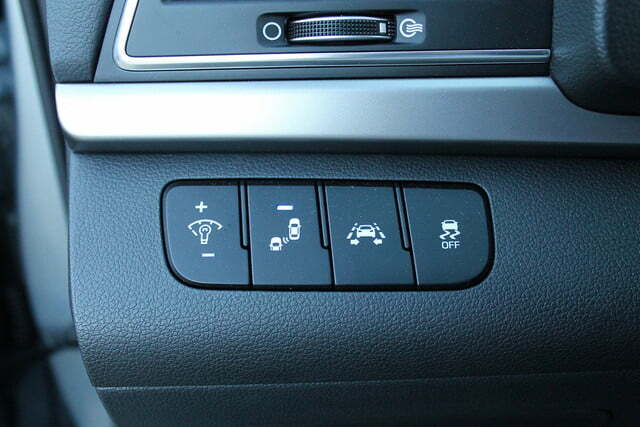 Keeping with the theme of autonomous safety systems, the sedan provides Lane Keep Assist and Smart Cruise control, however they’re not available on the base model. One thing on the adaptive cruise control though, it does not function below 6 mph, which means it’ll slow you down, but not stop you. 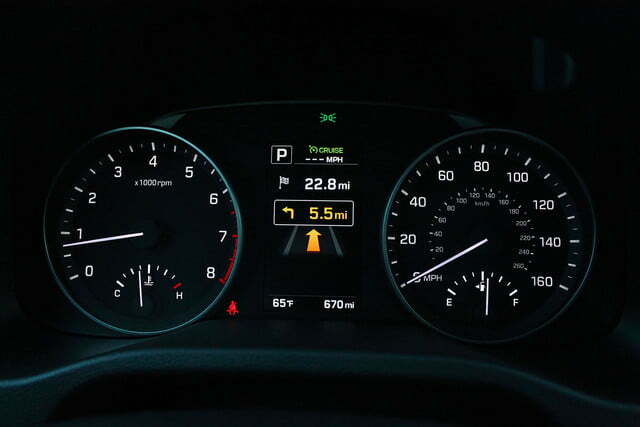 The dashboard does send a warning before it returns braking and acceleration controls to the driver, but this seems like a large oversight by Hyundai. Why? 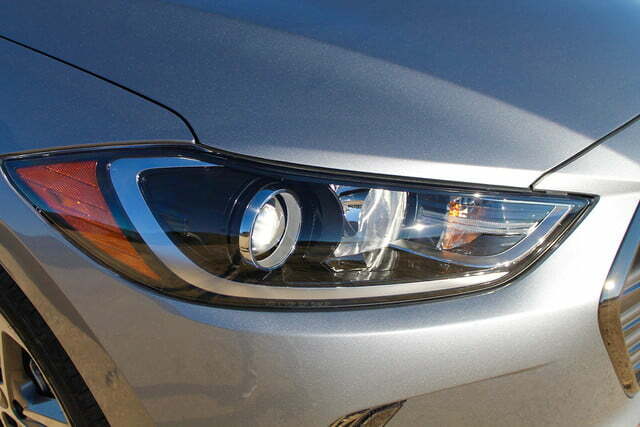 It’s likely that the low-speed radar sensor necessary to stop the car would increase the vehicle’s base price. 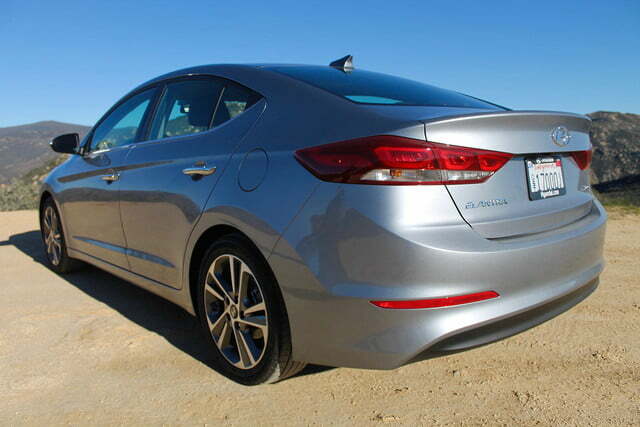 Hyundai’s Blue Link system is also featured on the Elantra for the first time, which allows owners to remotely start their vehicle, operate the door locks, find their vehicle with mobile devices, and use Google’s destination search function. Blue Link is compatible with wearable devices like Apple Watch and Android Wear as well, and also provides roadside assistance and stolen vehicle recovery. 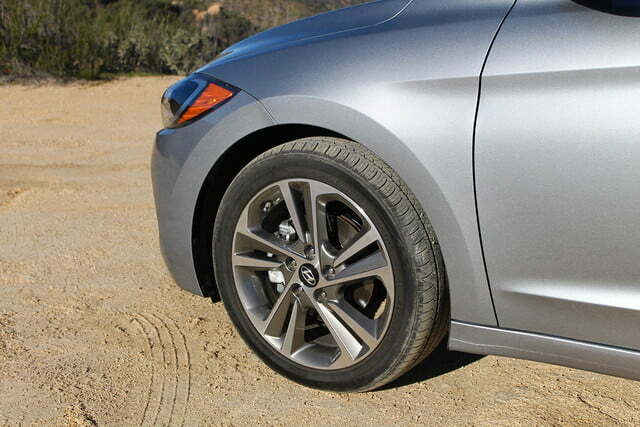 What makes a good compact a good compact? Is it a smooth ride? Good fuel economy? An interior more comfortable than a dorm room futon? At the end of the day, a successful compact must accomplish all of these things, and do each of them at a good value. Judged through this metric, the Elantra is without a doubt a smart choice for small car buyers. Think about this — you can buy a brand new Elantra with an automatic transmission, Apple CarPlay/Android Auto support, Bluetooth connectivity, and a highway fuel economy rating of 38 mpg for just $18,950. That ain’t bad. However, meeting the standard and exceeding it are two different things, and those who like a little more pizzaz in their commute might want to consider other options. 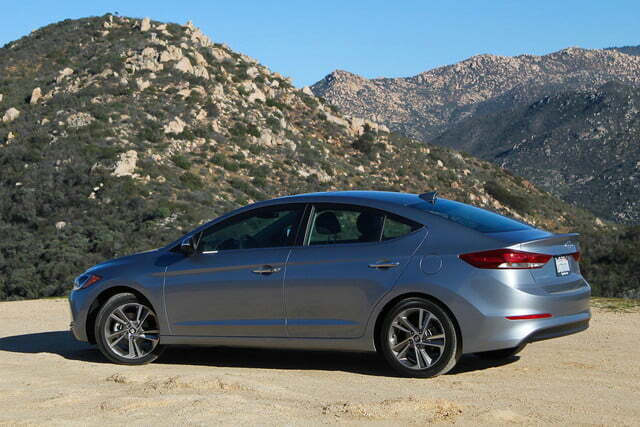 Or, you could wait until later this year, when Hyundai will release the Elantra Sport model. 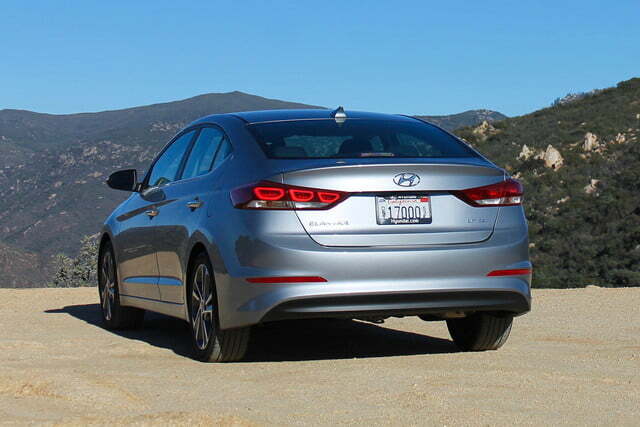 Featuring a 1.6-liter turbocharged engine with around 200 hp and an independent rear suspension, the six-speed Elantra Sport might inject a bit more flavor into a nameplate that is an undeniably logical, but perhaps a bit bland.